DEARBORN, Michigan – The Mayor of Dearborn, the Wayne County Commission Chairman, and the State Representative from Lansing were all on hand at the Dearborn Board of Education meeting on March 12 to congratulate the two Response to Bullying Poster Contest winners. 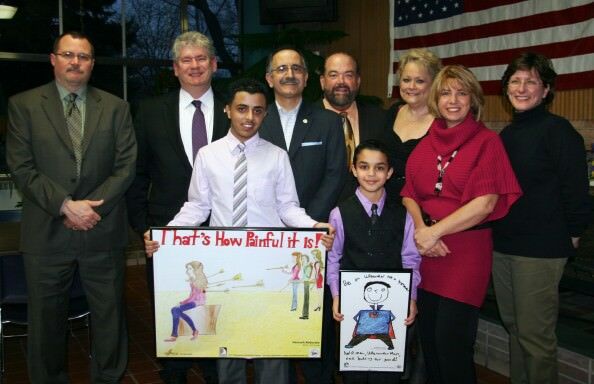 Edsel Ford High School junior Hamzeh Abdorabehe and Geer Park Elementary fourth grader Kaidhum Ganem were honored for their winning poster designs. The contest was first announced at the district-wide Response to Bullying kick off event in September of 2011. (The program encourages students to treat others with respect and provides tips on what students should do if they find themselves in a situation where bullying is present.) Students from all Dearborn schools submitted entries and judging was done just prior to the Thanksgiving break. In total, over 1,500 posters were submitted. The number was narrowed down to about 40 and from there two winning designs were selected, one for secondary and one for elementary. “I want to thank all the students who took part in the contest, especially our two winners. I also want to thank all of our staff for supporting this effort and getting our students involved,” commented Dearborn Public Schools Superintendent, Mr. Brian Whiston. 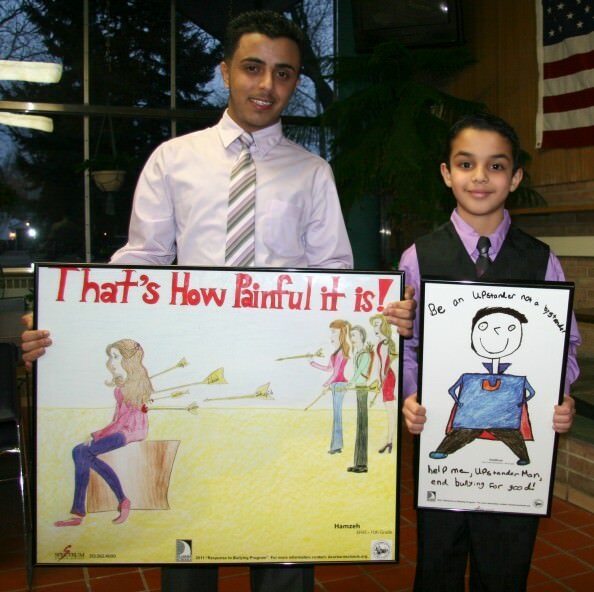 L to R: Edsel Ford Junior Hamzeh Abdorabehe, and Kaidhum Ganem, Geer Park Elementary student show their posters. The winning posters will be displayed at the state capitol, in all schools, support buildings, buses, and businesses throughout the community. A calendar may be made with 12 of the other designs depending on the availability of outside funding. The district is collecting data to determine the most common type of bullying behavior taking place and where those incidents happen. This will aid in stopping bullying behavior before it has a chance to start.